Happy Halloween! We have a special giveaway for all of you today. Up for grabs is this beautiful nail gift set with 6 awesome shades of nail polish from BeautyUK. The No.2 - Midnight Minx gift set is the perfect way to discover what your favourite shade is. The Rafflecopter form below has all the different ways to enter. The more entries you have, the more your chances of winning. If you have any questions, then leave a comment and I will get back to you. Giveaway rules:- This giveaway is open to UK residents only. - One winner will be chosen via Rafflecopter and announced on this page. - The winner will be contacted by e-mail within 3 days of the competition ending, if they do not respond within 7 days another winner may be chosen. 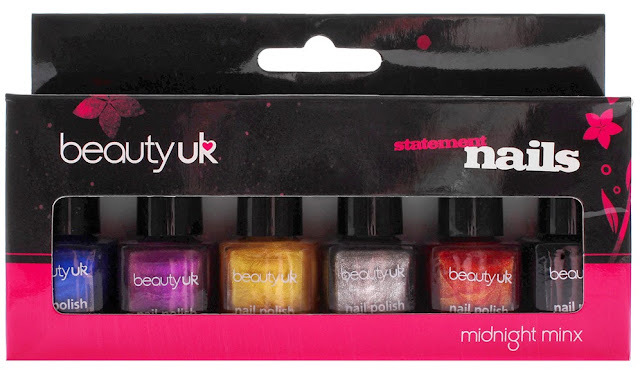 - The prize will be sent directly to the winner from BeautyUK Cosmetics. Enter below. All the best!